With just 23 breweries statewide, there’s plenty of room for another one, and we’re probably lucky that Lafayette-born Justin Boswell decided to come home to Louisiana and open his brewery in New Orleans: Wayward Owl Brewing Co, which has been rolling out its product to local bars and restaurants since the beginning of December. The business occupies a 10,000 sq. ft. building at 3940 Thalia Street in Central City. Designed by architects Dreyfous and Seiferth in 1947, the Art Moderne beauty is most well known for housing the 1,000-seat Gem Theater from 1951-1960. 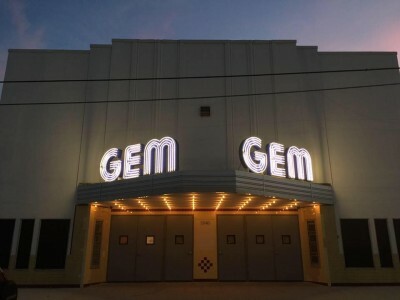 Because it’s listed on the National Register, the open-space layout had to stay, but Boswell says he and his crew wanted to preserve as many aspects of the past as they could anyway, like the theater seats and the long-gone original “Gem” sign, which Boswell had replicated by a local company, Graffiti Graphics. The extensively renovated space has a tasting room and a stage, though there’ll be no live music except for private and special events. A self-professed foodie, Boswell plans to introduce food by way or food trucks or pop-up restaurants. Boswell also wants to eventually host “small outdoor movie series that are charity-focused” outside in the lot. The tasting room will be holding a grand opening this weekend, on Saturday, December 17. Boswell, who honed his skills at the Black Raven Brewing Co. in Redmond, Washington, is focusing on high-quality specialty beers. “I like to push the limits on what I want to drink,” he says. The company is experimenting with its prototype series, where “any candidate can be either immediately retired or graduate to an actual beer in our standard specialty series,” says Boswell. “Once these are done, our lineup will include year-round Clean Slate IPA, Family Tree Kristallweizen, and a yet-to-named ESB” (ESB stands for “extra special bitter”). At the opening, you’d be able to sample the following four: Double Dry Hopped IPA (“The beer geeks would want to know it has 2.2 pounds of hops per barrel,” notes Boswell); Proto ESB, an English-Style Bitter; Proto Wheat, which is a clarified Kristallweizen; and Scotch Ale. In case you’re wondering what’s in the name, it’s both a nod to Boswell’s Scottish heritage (his family crest contains an owl), and a “tip of the hat” to his former mentor and employer, the Black Raven Brewery, with whom Boswell plans to work on some joint projects in the future. “The laws here were starting to change for manufacturing facilities and breweries, opening up the possibilities of what you can do, and where you can open a brewery, and how you can open it,” says Boswell. As for the local beer scene – “It’s young, it’s a baby” – says Boswell with a laugh. He doesn’t see other local brewers as competition but more of a “brotherhood” banding together. “The more of us there are, the more impact we have as a collective voice legislatively,” he points out. Speaking of local beer, what is Justin Boswell drinking besides his own beer? “Quite a bit of Great Raft beer” (Shreveport), Second Line IPA by Second Line Brewing (“I love those guys”), and “a few cool specialty beers, like Rectify Porter” by Urban South Brewery. “Right out of the gate, I think we’ll be bringing a more even-keeled knowledge to the process from start to finish, definitely my knowledge of hop manipulation because I’ve learned how to brew where hops are grown; I got to go out to the farms and pick my own hops,” he elaborates.